PRC Director Brea Segger has been named a finalist for Vancouver Island’s “Top 20 under 40 Business & Community Achievement Awards”. For a decade Brea has been a Director at Pacific Rim College. She founded the world-renowned Holistic Doula Certificate program and was a co-visionary of the Permaculture Design and Resilient Ecosystems Diploma program. When she is not at the college, Brea can be found caring for her gardens at Ravenhill Herb Farm. Top 20 under 40 winners will be announced at an awards gala in April. PRC Named Finalist for Food Security Award! Pacific Rim College has been named a Finalist for the 2017 EcoStar Awards in the category of Food Security! We are thrilled to receive this honour in recognition of the programs and services PRC offers in both the School of Holistic Nutrition and the School of Permaculture Design. The Diploma of Holistic Nutrition is the most comprehensive on-site program in North America, while the Permaculture Design and Resilient Ecosystems Diploma is a globally-unique program offered on two campus farms on the Saanich Peninsula of Vancouver Island. The Vancouver Island EcoStar Awards recognize outstanding environmental achievements and leadership by businesses, organizations and individuals. These awards are given to local champions of initiatives, projects and innovations that contribute to a vibrant future in which our communities and ecology both prosper. 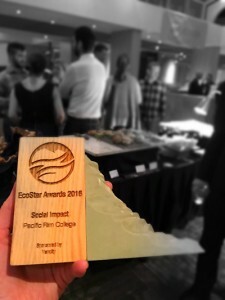 Last year Pacific Rim College won the EcoStar Award for Social Impact. The 2017 award winners in 19 categories will be announced at a November 16 award gala. 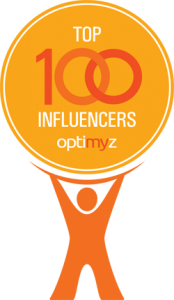 Pacific Rim College founder and president Todd Howard was named as one of Canada’s Top 100 Health Influencers by Optimyz Magazine! A feature on all those recognized is in the current newsstand copy of Optimyz Magazine. Congratulations to all! PRC wins EcoStar Social Impact Award! Pacific Rim College has won the ‘Social Impact’ award in the 2016 EcoStar Awards. Pacific Rim College has been named as a 2016 Finalist for the EcoStar Awards in the category of Social Impact. EcoStar winners will be announced at a gala event on November 10, 2016. PRC named Vancouver Island ‘Professional Business of the Year’! PRC has been named the Vancouver Island ‘Professional Business of the Year’ in the 2016 Vancouver Island Business Excellence Awards. We are thrilled and honoured to be presented such a prestigious award! PRC has been named a finalist for the 2016 Vancouver Island Business Excellence Awards in the category of ‘Professional Business of the Year’. We are honoured to have first been nominated and then chosen as a finalist for such a prestigious award. The winners will be unveiled at a January 21st awards gala. Congratulations to our team for earning this recognition! PRC Earns Finalist Recognition as Victoria Business of the Year! Pacific Rim College was named the finalist for the Greater Victoria Chamber of Commerce Business of the Year (11-25 employees). Congratulations to the Pacific Rim College community for garnering such prestigious recognition! As a result of being a participating sponsor at the 2013 Living the New Economy (LNE) event in Victoria, Pacific Rim College president Todd Howard met Andrew MacDonald, visionary founder of the upstart upcycler Hammer and Tidy. Soon after the event, the college hired Andrew to help with some projects for a new wing that was under renovation. A couple of initial projects led to a year’s relationship in which Hammer and Tidy completed a feature pallet wall, refaced a kitchen and two bathrooms, made numerous pieces of furniture, built teaching lecterns, and expanded the college’s herbal dispensary. The best part is that virtually all of the materials were salvaged, and wood was stained using a balsamic vinegar and steel wool concoction. Both Pacific Rim College and Hammer and Tidy have the Opportunity Fair of LNE to thank. This year’s Living the New Economy Global Live is truly going global, with opportunities for participation no matter where you live. See the full story at LNE’s website. 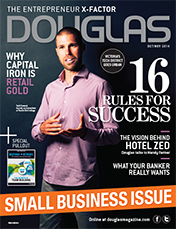 Pacific Rim College president Todd Howard is featured on the cover of the Oct/Nov 2014 issue of Douglas Magazine and in the article entitled “16 Rules for Success”.